2018 Update: We still stand by these 7 tips to help you hire a personal trainer, but you may also want to check out our post about how to stay fit in winter. You have a few options if you want to hire a personal trainer: join a gym and pick one of its staff trainers, find a trainer who works out of his or her own private space, or choose someone who’ll come to your home to work with you. But how do you find the right professional? Determine your goals. Do you want to train for a marathon or other event? Do you want to get healthier before trying to get pregnant? Do you want to lose weight, improve your endurance, reduce stress, feel more energetic, get stronger, or look better for your upcoming wedding or vacation? Make a shortlist. Assemble a list of names by asking friends, family members, and coworkers; checking reviews on Yelp; and searching by location on sites like IDEA Health & Fitness Association and The American Council on Exercise, which gave me the names of 211 and 97 trainers, respectively, within 10 miles of my zip code (in my medium-sized city). 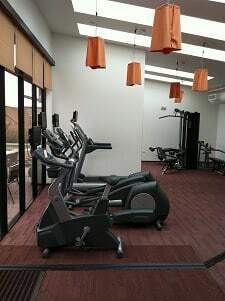 Findyourtrainer.com lets you search by location type (health club, private studio, your home), time of day, price range (from under $80 to over $120), gender, number of clients (individual, partner, or small group), and weekend or weekday. You can also fill out a simple form on the site to receive personal recommendations to help you hire a personal trainer. Interview the candidates. These services aren’t cheap, so you’ll want to hire a personal trainer who closely meets your requirements and who you feel comfortable with. Explain what you’re looking for and what your goals are (see above), and see if you click personality-wise. Ask any specific questions you might have — for example, how the trainer would work around a specific physical problem you’re experiencing (e.g., bad knees). Check if the trainers provide a free trial before clients commit to a package of sessions. And if they start pressuring you to buy special shakes, supplements, etc., consider it a red flag. If you have a limited budget, get creative. Depending on where you live, you might pay $35 to $65+ per hour for an independent personal trainer. If that sounds steep, find someone who offers group or partner training — you can save money by sharing sessions with a friend or two (and it might even be more fun). Try the YMCA or your town or city’s recreation department — or, if you belong to a gym, ask if it offers small-group strength training classes. If you’re self-motivated, hire a trainer online to design workout routines for you. If you’re really pressed for time, let the trainers come to you. One reader had good luck with this method, but YMMV: She placed an ad on Craigslist that explained exactly what she and her husband were looking for in a trainer. Although she could tell that many of the messages she received came from people who barely had read her ad, one stood out. She hired him and he turned out to be a great choice. Corporette readers shared a few location-specific recommendations, which we thought we’d pass along; bear in mind these are a few years old. If you’ve been lucky enough to hire a personal trainer who was a good match, how did you find him or her? How has your trainer helped you reach your goals? What’s been the most helpful thing about working with someone one-on-one? This is an execellent p’ost. I think my Dad covered all of these pointer’s in hiring a personal trainer for MOM, b/c Grandma Leyeh said she had a fat tuchus which should be smaller. I think the most important is to get someone with good reference’s. Mom was skittish about showing her body to just any trainer, but she now has a nice spandex outfit that she does not hesitate to wear in front of her trainer. She has a MALE trainer, which is something I would NOT want, b/c whenever I have a trainer help me at the NYSC, it is all I can do to make him keep his hand’s away from my tuchus when he is showing me the right way to use machines. The other important principel is to make sure the trainer is CERTIFIED. That is the ONLEY way you know he/she is not just a schlub trying to make an extra $50 by grabbing at us. FOOEY! I’ve found some of the indpendent studios near me offer “doubles” or “triples” – not quite as good as a one one one with a personal trainer, but significantly cheaper and working out with just two or three students per instructor is almost as good. As an aside, I really hate these “__# of Ways to Do ___” bulleted list type posts that read to me more like a BuzzFeed article and less like a helpful, well researched post. I understand that they probably have a higher clickthrough rate on social media and other places, but I’m not a fan. I think you’ll also see that they tend to have lower reader engagement when judged by the number comments…. I’ve only used a trainer once but found it worthwhile. It was when I used the free-to-me gym at my office and when I was there regularly, I could watch and see which trainers seemed to have what I wanted in terms of ideas, attitude. Arranged a weekly weights session with 1-2 other people and found that I got enough attention but the group made it affordable. She was able to help with diet and cardio, not just weights. I got in the best shape ever during this time and learned a lot about proper form and putting together a routine that is adaptable. Ask what other classes/certifications they have, and how they incorporate those skills into training sessions. I train clients with free weights and kettle bells, pretty much exclusively. I have other certifications, but that’s really my wheelhouse. There other trainers at my gym who have martial arts or boxing backgrounds, and incorporate those areas more in their training (which is really fun, if you’ve never hit bags before). One trainer always uses TRX moves in his sessions because he wants to convert personal training clients into small-group TRX attendees. I’ve worked with a few personal trainers and I can say definitively that the most important thing is fit. Ultimately you’re going to spend a lot of time with your trainer (generally 2-4 hours a week) and you’re very vulnerable with them (transparency is key, whether it’s sharing what you’ve eaten that week or how you haven’t worked out since you last saw them) – so it should be someone you feel comfortable with. I highly recommend asking for a “test” session to see what their style is, and then make a decision from there. Also, I would shy away from any trainer that requires you to sign a long-term contract (longer than 90 days)…this generally means that they have trouble retaining clients, and there’s really no business reason for requiring such a long contract. Finally, ask what they’ll provide as part of their services – some will go out of their way to provide meal plans, will review your food journal, etc. – while some are focused only on the strengthening/exercise aspect of the job. In my experience, it’s really a holistic process, so you should try to find someone that will provide the “whole package.” I had tremendous success with most of my trainers (I’ve had 3 total, due to job relocations), and I think it’s a great option for the right situation. I definitely agree that knowing what your goals are is really important. You can set out what experience you want to have so that whoever you hire knows just what you want. My sister and I are working on getting healthy and we have been thinking about hiring a trainer. I’m sure that these tips will help us do just that! I like the suggestion to determine your goals. I think that if you set goals then you have a reason to train. I think that if I was going to start going to the gym then I would want to have something to work for.